It may have taken the company more than 20 years, but Vistaprint finally opened the doors to its first store this month. As a global e-commerce marketing products company, having a bricks-and-mortar location wasn’t necessarily in its original business model, but increasingly it has realized its customers want a physical location to see the company’s business cards, invitations and other promotional materials in person. It’s not alone. Online retailers establishing a presence in the real world, in addition to their virtual ones, is an emerging trend in retail, not to mention an opportunity for landlords to find a new wave of tenants. Amazon’s takeover of Whole Foods this month spoke volumes on this front, and while it remains to be seen how that works out, the $13.7-billion (U.S.) purchase price represents quite a gamble if it fails. 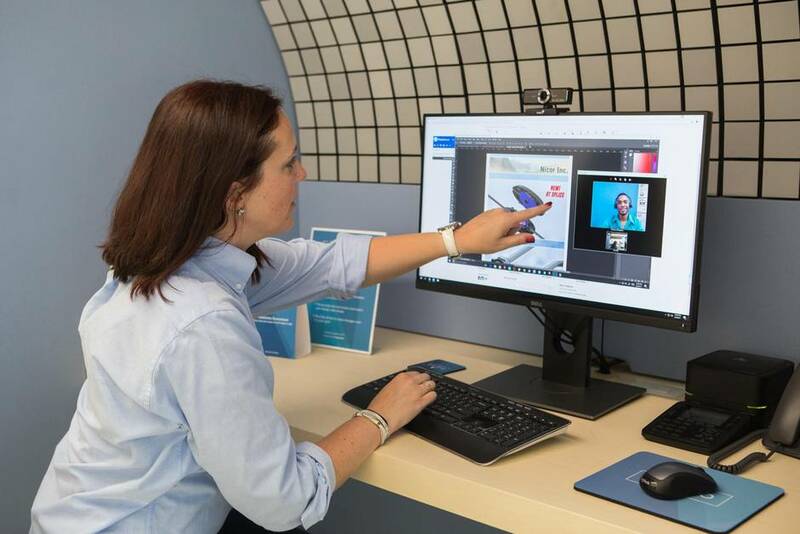 For Vistaprint though, its brand-new Toronto store, called Vistaprint Studio, was a byproduct of listening to its customers, who wanted to be able to go somewhere where they could actually see, touch and feel the products on offer. The downtown Toronto shop, formerly a Telus location situated on the ground floor of a 10-storey commercial building on King Street West, also has a number of design booths where clients can sit, talk and work with designers at a remote location, as well as work with in-store coaches on their marketing products and strategies. As the product of a year-long process of trying to figure out exactly what the experience would look like, Vistaprint Studio is very much a work-in-progress. 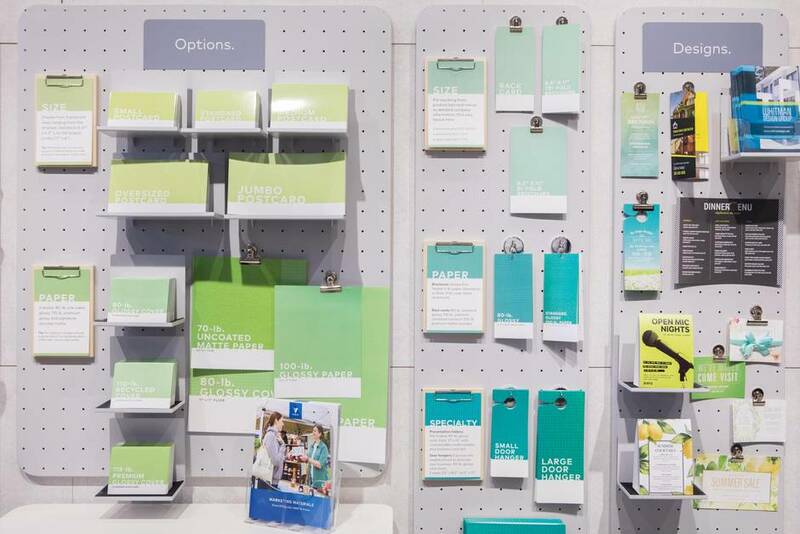 As a result, the store’s design is fluid, giving Vistaprint the option of tailoring the experience even more to customer needs as it evolves. “Everything we’ve built in the store we’ve built to be adaptable, so that as customers come in they can give us feedback on what’s working and not working, what they need more of,” Trynka Shineman, the chief executive officer of Vistaprint, says while visiting the Toronto shop. With no financial targets for the store, Ms. Shineman says the experience is set up to move in whatever the company’s highest growth market desires, all the while ensuring that the link between online and offline interaction is seamless. Vistaprint is far from alone in its shift to a physical footprint. The Dutch company is following in the footsteps of companies such as Chinese e-commerce giant Alibaba, which this year lodged a $2.6-billion bid to take department store Intime Retail Group Co. private. Closer to home, Vancouver-based online men’s wear retailer Indochino is undergoing a retail resurgence this year, with four new U.S. showrooms scheduled to open this summer. That follows hot on the heels of new stores in Edmonton, Calgary and Burnaby, B.C., which opened in April. The retailer, which was founded in 2007, opened its first store just two years ago, and will be up to 17 by the end of the year. “I think the days of being an online-only company are going to be coming to an end, whether that’s three years from now, five years from now or what have you,” says Indochino CEO Drew Green. While the company is enjoying extraordinary success – it recently highlighted 57-per-cent revenue growth year-on-year for the six-month period between December and May – its brick-and-mortar strategy certainly helps. It has found that having physical locations actually helps its online sales, too. “When we open a showroom in a market, online sales in that market grow twice as fast versus markets that we’re not in,” Mr. Green says. That success may be partly attributed to Indochino’s track record over the past few years. As an established clothier company, it may well make it easier for it to successfully transition into high streets and malls across North America. 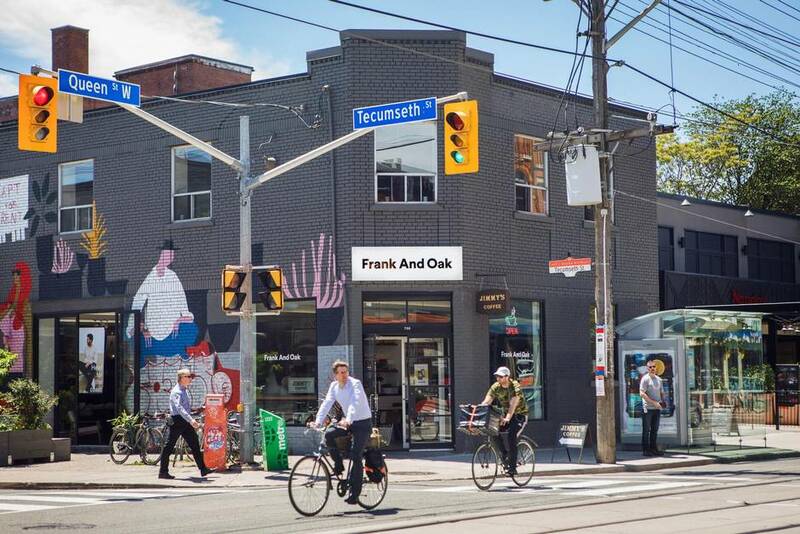 Clothier Frank and Oak has made a similar migration, opening 10 stores and a number of pop-ups in the five years since establishing its brand as an online entity. Two if its Toronto outlets are in malls and another blends into the streetscape of the hip Queen Street West shopping district, sharing space with a coffee shop. Other less established businesses may be taking a wait-and-see approach. “I think for right now those early adopters are being watched very carefully because it’s a delicate balance to go from online to bricks and mortar and what combination [of offline and online business] do you need and where does your business come from?” says Keith Reading, head of research for real estate service Morguard in Toronto. Another factor is the kind of business a company is in. For example, product-based businesses such as Vistaprint or Indochino may fare better than an accountant, or another kind of service. To tempt online retailers, and others, to dip their toes in the water, Oxford Properties launched Concept at Toronto’s Yorkdale Shopping Centre this year. The space is designed to house a rotating cast of vendors, without the commitment of a long-term lease. 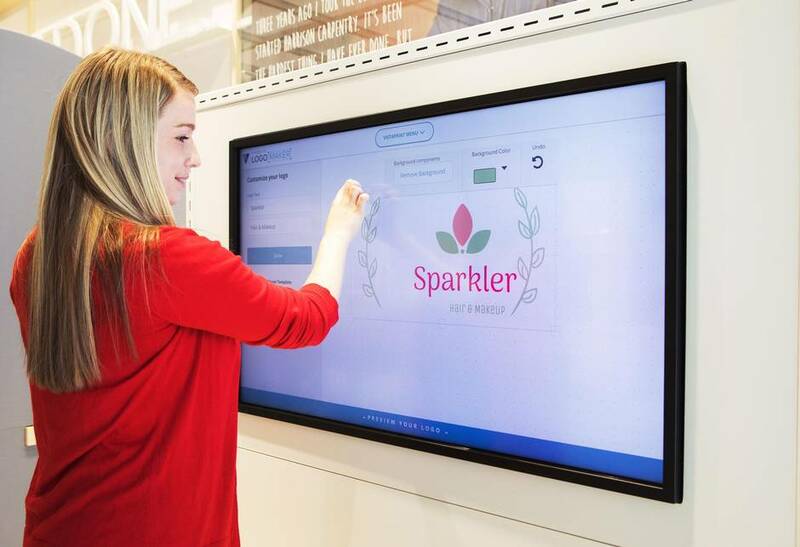 Intended for “bridging the gap between click and brick,” according to Marjorie Mackenzie, vice-president of retail at Figure3, the Toronto-based firm that designed it, the 3,600 square feet of space offers maximum flexibility to any retailer. According to Mr. Reading, this kind of pilot could be a win-win for everyone. 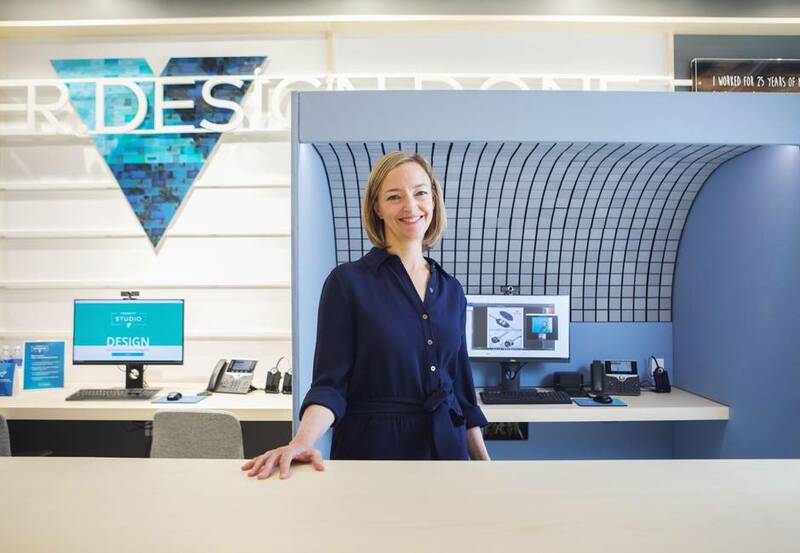 Andrea Armstrong, a Vistaprint customer who runs the online-based Happiness Is Inc. clothing company, is soon joining the ranks of pop-up stores, having negotiated a one-month lease at Toronto Pearson International Airport to put her goods in front of travellers and tourists.